This week I haven't even tried to meal plan - lots of different things going on combine with last weeks failure on meal planning ensured that I had lots of ideas left over for this week ;) (or at least that is my excuse and I'm sticking to it). Anyways I added some of the extra spices into the mix and it smelled amazing (yes I am bragging) but as the sauce began to cook the flavours developed even more and I may or may not have tested several spoons of the cheese sauce before adding it to the shells and baking the dish. The only downside is that the entire things takes about an hour to make (including the 30 minutes of baking time - but frankly it took me that long to do the dishes so the husband sees it as a win-win lol). 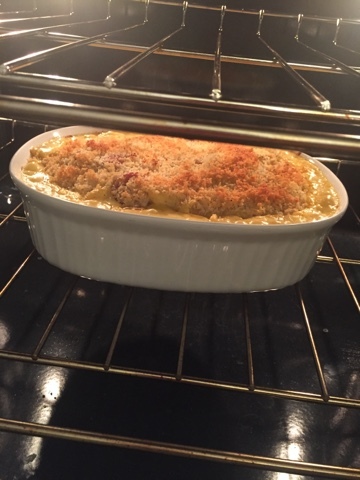 Here is the recipe: (the basic recipe is below, I have cross out the parts I omitted and the items in italics are the add ons for the fragrant Mac and Cheese - so if you want to use the basic recipe skip the items it italics) (Basic recipe is from Alton Brown on the FoodNetwork.com website). Spray the bottom of a oven safe cooking dish. Put the sausages in the dish and into the oven - I left them in until I was ready to add the cheese to my sauce or about how it takes for the sausages to start to split. Because I was using fully cooked I wasn't too concerned but I did want some nice brown bits on the sausages. While the pasta is cooking, in a separate pot, melt the butter. (remember to use low heat for this I haven't before and I've ended up with Brown butter - great for other things not so great for mac and cheese). Whisk in the flour and mustard and keep it moving for about five minutes. I added the cumin, coriander, garam masala and turmeric here. After a few minutes I also added the onion and garlic to get it cooked really well for husband (and I really finely dice the onion - almost a mince). Make sure it's free of lumps. Stir in the milk, onion, bay leaf, and paprika. Simmer for ten minutes and remove the bay leaf. Temper in the egg. Stir in 3/4 ALL of the cheese. Season with salt and pepper. Fold the macaroni into the mix and pour into a 2-quart casserole dish (NOTE it is REALLY important to spray the casserole dish before putting the mix into the dish or leave the cleaning up to your partner either way - just be prepared for complaints from the cleaning staff partner if you don't spray the dish ;) . Top with remaining cheese. Melt the butter in a saute pan and add the bread crumbs to the pan and coat with the butter. (I always season my bread crumbs with salt and pepper, sometimes a little garlic salt - taste them as they are toasting in the pan to make sure they are tasty). Top the macaroni with the bread crumbs. Bake for 30 minutes. Remove from oven and rest for five minutes before serving.